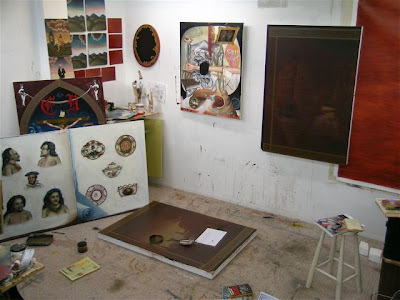 A NEW STUDIO SHOT, LIKE PULLING TEETH AT THE MOMENT, I'M PAINTING ANOTHER ONE OF THOSE FRAMES WITHIN A FRAME, USING A GREEK SUAVSTIKA PATTERN (LIKE IN THE CHRISTCHURCH CATHEDRAL) THAT I'VE PAINTED A FEW TIMES NOW. YOU NEED 14 LINES OF 2 DIFFERENT TONES OR COLOURS TO FORM THE UNDULATING PATTERN. I LIKE TO PAINT ALL THE LINES IN FIRST, THEN PAINT THE CROSS-BARS TO FORM THE PATTERN AS I DON'T LIKE HAVING THE DRAW IT ALL OUT FIRST AS IT FEELS TOO MUCH LIKE COLOURING-IN. IT'S A DIRGE OF A JOB AS IT IS, BUT I GUESS IT SORTS THE GHOSTS FROM THE SHEETS.